Portrait purported to be of the first Earl of Derby but the costume is of a later period. Thomas Stanley was born c. 1435 to Sir Thomas Stanley, 1st Baron Stanley and Joan Goushill, daughter of Sir Robert of Heveringham Goushill and Lady Elizabeth FitzAlan, Duchess of Norfolk; herself the daughter of the 11th Earl of Arundel and Lady Elizabeth de Bohun. Lady Elizabeth was aunt to a royal Duchess, Lady Eleanor, who married Prince Thomas of Woodstock, Duke of Gloucester [youngest son of King Edward III] and the wife of the future King Henry IV, Lady Mary [she died in 1394; Henry was crowned in 1399]. Mary was the mother of Henry IV’s heir, Henry V.
King Henry VI, unknown artist, late 16th or early 17th century. Transferred to the National Portrait Gallery in 1879 from the British Museum. So, Thomas was born in to good stock having connections to the Lancastrian monarchs. Thomas would have been a 3rd cousin of King Henry VI having shared 2nd great-grandparents; Sir William de Bohun, 1st Earl of Northampton [grandson of Edward I] and Lady Elizabeth [born Badlesmere]. Although Henry VI was King during Stanley’s career at court, Stanley’s family married him to a daughter of Sir Richard Neville, 5th Earl of Salisbury and Lady Alice Montacute, Countess of Salisbury. Through his paternal grandmother, Lady Elizabeth Stanley [born Harrington], Lord Stanley was a first cousin, twice removed of Sir Thomas Parr of Kendal. The two shared Sir Nicholas Harrington and Isabel English as grandparents [Parr was a 2nd great-grandchild]. Lady Elizabeth Stanley was aunt to Lady Alice Parr [born Tunstall] by her sister, Lady Elizabeth Tunstall [born Harrington]. Lady Alice Parr married Sir Thomas Parr, Sheriff of Westmorland; they were grandparents to Sir Thomas Parr of Kendal. In addition to being related to Thomas Parr by Lady Alice, Parr’s grandaunt was Lady Eleanor Neville; wife of Thomas Stanley. Eleanor and Thomas had seven sons and six daughters. Eleanor died shortly after Edward IV was reinstated as King for the second time . “The White Queen”, BBC. The portrayal of the marriage of Lord Stanley to Lady Margaret Beaufort. Upon Stanley’s marriage to Lady Margaret Beaufort in 1482–it was not expected of Margaret to supply him with anymore children. Margaret must have been relieved. After her birth of her only child, Henry Tudor, at the age of 12/13, she probably didn’t want to experience the pain that she had at such a young age. Stanley offers the crown to Henry of Richmond on the battlefield. 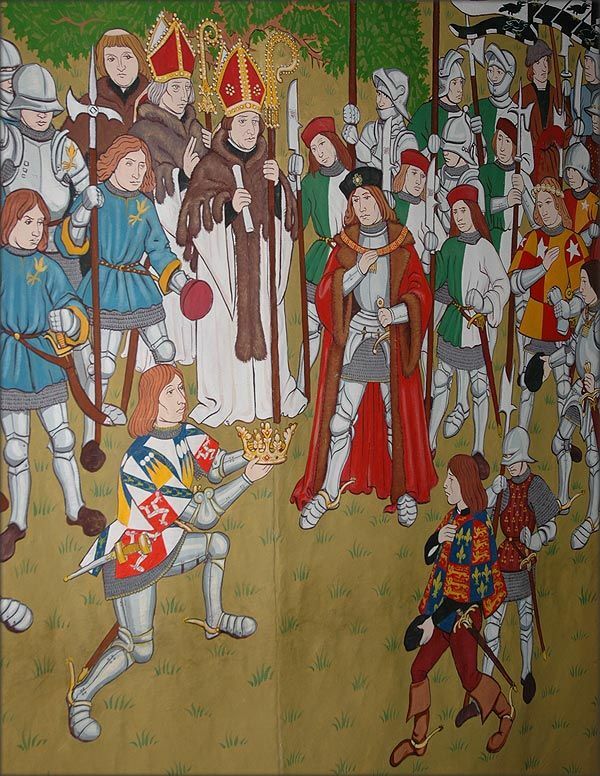 Stanley is known for his support of his stepson, Henry Tudor, against Richard III at the Battle of Bosworth. His decision to back Tudor ultimately decided the fate of the outcome. Richard would be defeated. 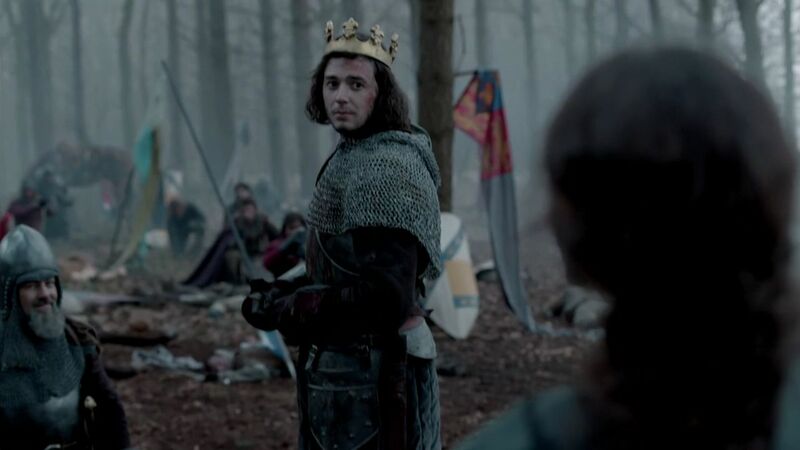 On the battlefield, it is said that Stanley crowned his stepson, King of England, as King Henry VII [of the House of Tudor]. Did Stanley’s attachment to Henry’s mother have anything to do with the defeat? Most likely. However, there was another reason Stanley may have switched loyalties. “The White Queen”, BBC. 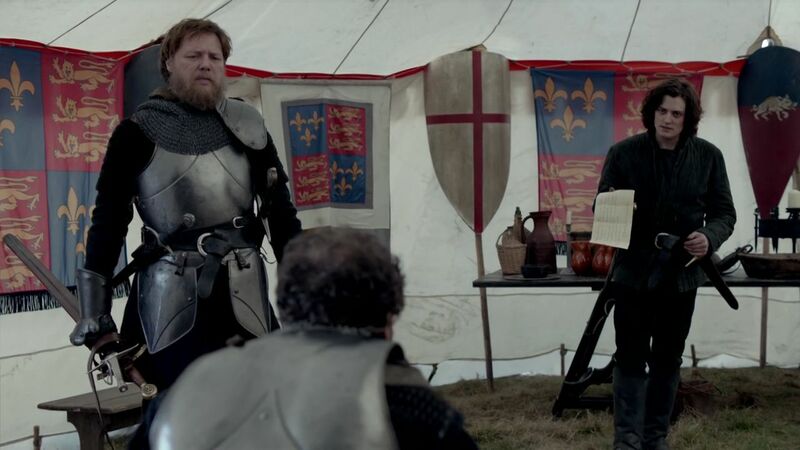 Richard III detains Stanley’s eldest son, Lord Strange. “A little before the landing of these persons (Richmond and his adherents) Thomas Stanley, Steward of the King’s Household, had received permission to go into Lancashire to visit his house and his family, from whom he had long been separated. Still, however, he was permitted to stay there on no other condition than that of sending his eldest son, George Lord Stanley, to the King at Nottingham in his stead, which he accordingly did“. The same chronicler avers that after the landing of Richmond was known to Richard, the King summoned Lord Stanley to join him at Nottingham, and received a refusal on the plea of sickness. Soon afterwards, it is added, Lord Strange attempted to escape, was prevented, then confessed his guilt, acknowledging that his uncle, Sir William Stanley, was privy to Richmond’s expedition, but declaring that his father was innocent, and if his own life were spared would still join the King. If Lord Stanley did not join Richmond on his landing, it was, we are told, because he feared for the life of his son, then very possibly safe and sound at Latham. It is Lord Strange’s perilous position that, in the old chronicles, makes Lord Stanley pretend to retreat from Lichfield, which he left open to Richmond; this is what he pleaded as an excuse for his neutrality, during, the alleged interview with Richmond at Atherstone three nights before the battle; and this is to account for his indecision during the battle itself. Perhaps it may turn out that Lord Strange was never in Richard’s hands at all, and that Lord Stanley never stirred a finger or moved a man until the fate of the battle was decided. All accounts agree that Richard’s final charge might have been successful had not Sir William Stanley, with his three thousand men, suddenly come to the rescue of Richmond. But Sir William seems to have been a rasher, or rapider man than his elder brother, and much more ready to run risks. When Richard was killed and the battle over, the battered crown which had fallen from his helmet during the conflict was, according to a plausible tradition, placed by Lord Stanley or his brother on the head of the victorious Richmond. There was no longer room for doubts, scruples, hesitations. Nor did the Stanleys show any pity for those of their coadjutors of the ended reign, who to the last had remained faithful and true to Richard. Three days after the battle a batch of Richard’s adherents was executed -Catesby among them. He made his will on the day of execution, and it contained this significant, this striking passage and petition: “My Lord Stanley, Strange, and all that blood! help! and pray for my soul, for ye have not for my body, as I trusted in you“. “The White Queen”, BBC. Lord Stanley offers the crown to Henry Tudor. Lady Margaret stands on the battlefield to see her son crowned. Eleanor was buried in London’s St. James’s Church, Garlickhithe. There is no evidence that her body was reinterred at Burscough Abbey, the Stanleys burial place in Lancashire; although an effigy of her was added to Lord Stanley’s grave when he was buried in 1504. 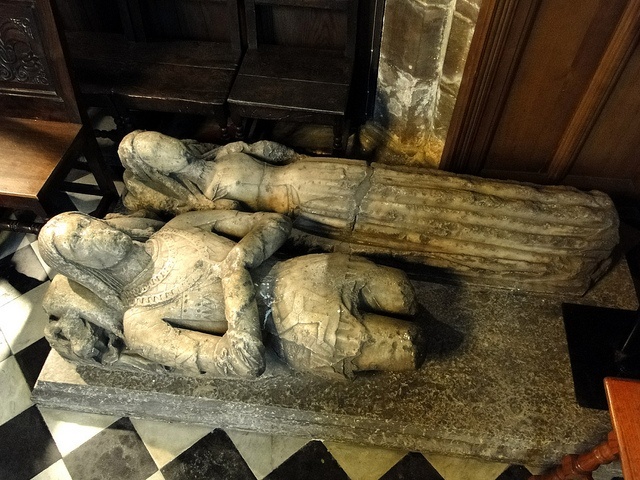 Effigy of the Earl of Derby and Lady Stanley [Lady Eleanor Neville]. Lord Stanley [Earl of Derby by now] died, probably about the age of seventy. His death must have occurred between the 28 Jul 1504, on which day his will was dated, and the 29 Nov in the same year, the day on which it was proved. He left to the King a cup of gold, and legacies to this abbey and to that, duly providing too for masses on behalf of his own soul, of those of his wives, relations, friends, servants, and in one case, especially for the souls of all them lie had in any wise offended, and for all Christian souls. David Baldwin. The Kingmaker’s Sisters: Six Powerful Women in the War of the Roses, 2009. The History Press, Gloucestershire, England, UK. Tudor Place Bios. Thomas Stanley, 1st Earl of Derby, Online Source.